You’ve tidied your way through your whole house, you’ve spring cleaned, decluttered, simplified, minimized, and every other social media buzzword out there, but still need a space for some extra stuff. Maybe it’s the holiday decor you only need annually, or maybe it’s items you were on the fence about getting rid of and are compromising by putting them “offsite” to see if you miss them. 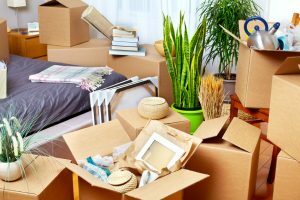 Or maybe you aren’t in declutter mode, but you need to store things before or during a move. All of these are great reasons to look to On The Move for storage solutions. What makes On The Move’s storage unique? On The Move has a container “vaulting” system, which keeps your items securely in a wooden crate-like, stackable container. These vault containers are stored in a climate and pest controlled environment – unlike many self-storage units where changing temperatures, unwanted critters and bugs, and even flooding can damage your items. How big are these “vaults”? Can I really fit a spare bedroom worth of stuff in one? Each of our specialized vault containers is 8’x8’x5’ and can hold roughly 1500lbs. One container should be able to accommodate a bedroom worth of furniture or a whole lot of miscellaneous items! What if I need more space than 8’x8’x5’? This is a common occurrence when we store items during a moving process – when your move out date is drastically ahead of your move to your destination, we can accommodate your entire household worth of belongings by utilizing multiple vaults. Your containers will be stored together, and nothing will be left behind when you’re ready to move in. On The Move offers full-service storage solutions for your every need. Contact us today for a quote!